Did you know that you can use ChromaBlast to create high quality, photo-realistic transfers for colored, dark, or even black t-shirts? Yep, that's right, you heard correctly. 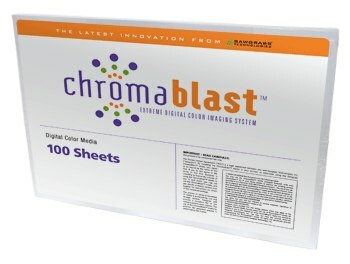 Regular ChromaBlast ink and paper are of course engineered to create a very high quality, long lasting transfer with a very soft hand that rivals the best direct-to-garment prints, for a tiny fraction of the cost when pressed onto white (or light colored) 100% cotton shirts. The process creates a special bond between the ink, the transfer film on the ChromaBlast paper, and the cotton fibers. With ChromaDark 3G Jet Opaque transfer paper from EnMart, you use the same ChromaBlast ink, printer, and driver, except you are printing onto a thin white base layer on top of a paper sheet, which is then trimmed either by hand or a cutter, peeled apart, and heat-pressed onto a 100% cotton shirt. The end result is a high quality photo-realistic image on any color of t-shirt - even black, having a softer hand and better drape than with other opaque transfer papers. For even more impressive results, use a vinyl cutter to contour cut around your designs and/or lettering. Keep in mind that since you are printing onto a white base layer, you will feel it on the shirt - similar to what you feel if you are using screen printing, direct to garment printing, or any other type of transfer. Except you haven't spent tens of thousands of dollars on the equipment. If you are looking for a relatively inexpensive way to produce one-offs or small jobs on dark colors, this is it. Includes silicone paper sheet(s) for use when pressing. See instructions for further details.